I have been looking for the tie dye print for a while now, although I know I could make it myself as I usually do, but it just happens that I found it before I managed to make it myself! So my last short trip to London (read about it here) I visited Primark as usual, no plans, just browsing and this one was the only thing that I found. 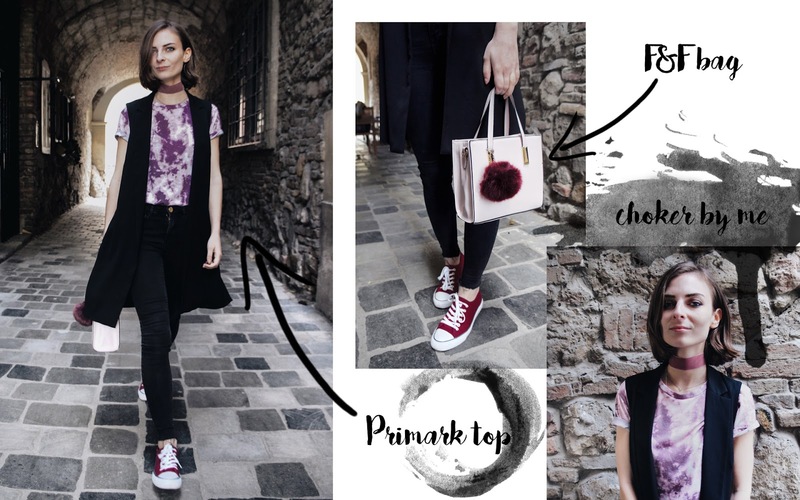 I decided to wear it with a simple longline waistcoat which was already a contrasting piece in it self to the t-shirt but I also added a girly thing, a pink bag with a fluffy pompom! BTW you can still vote for me in the InStyle & Maybelline blogger competition (they accept a vote a day per person) so I can go to NYFW :) Just click on "adatlap" under my name (Molnar Veronika) then click "szavazok"